Make it a habit to read the ingredient labels and see for yourself what is in your food and if there are harmful chemicals in foods. Is Your Food Safe For Your Family? If you dine out often or your larder is mostly stocked with instant or processed foods, then it’s time for you to take a closer look at what you’re eating. Is your food safe for you and your family’s consumption? See this list of harmful foods to avoid. Don’t underestimate the dangers of these foods. In the name of convenience, very often your meals may come in packages that you pop into the microwave oven and then served on your dining table. Or you could be using tasty sauces in most of your cooking. Or what about the snacks that your children eat between meals? There are thousands of chemicals that are found in the foods that we buy off the shelves. If they come processed, it is highly possible that they contain hydrogenated fats, preservatives, starches, sugars, salt, artificial flavoring and coloring, bulking agent, emulsifiers, etc. These may not sound harmful to you but read on to find out what they really are. These chemicals are the culprits that are slowly robbing us of our health. If you value your health, and I know you do, it’s time that you take a hard look at this list. Preservatives are used by the food industry to extend the shelf life of foods, in some cases for many years! The chemical characteristics that are supposed to kill bacteria and other organisms are also killing us. These are some names of preservatives used to preserve canned and dried fruits and vegetables from yeast and bacterial growth. Sulphur dioxide has been linked to mutations of cells that cause cancer. And the various sulphites above can cause asthma, blurred vision, dizziness, irregular breathing, stomach problems, nervous irritability, etc. Sodium nitrites are found in cured meat products like sausage, bacon, ham, frankfurters, hot dogs, luncheon meat, etc. These are highly toxic and affect the red blood cells, cause breathing difficulties and headaches. When combined with certain chemicals in the digestive system, it forms nitrosamine which is a very potent cause of cancer. Benzoic acid and sodium benzoate are used in pickles, sauces, margarine, packaged juices and carbonated drinks. These substances provoke allergies, cause asthma, skin reactions, hyperactivity in children, gastric problems, migraines and activates carcinogens in the body. On their own, these chemicals have no taste. But when combined with other foods, they become flavor enhancers. Monosodium glutamate (MSG) is present in most packet soups, instant noodles, gravy mixes, sauces, canned foods, frozen foods, soy sauce, etc. Some of the health effects associated with MSG are asthma attacks, headaches, heart palpitations, muscle tightness, nausea, numbness in the back of the neck, depression and mood swings. Don’t be deceived with food flavorings like “orange flavor”, “peppermint flavor”, “strawberry flavor”, “sour plum flavor” and the likes. Technology is so advanced that the cheaper alternative, synthetic chemicals, can be used to mimic this flavoring to be like the real thing. 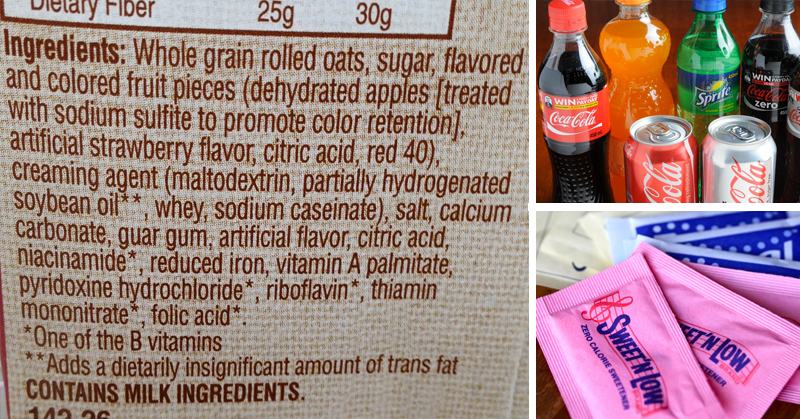 Most of the time, the ingredients do not include any of these mentioned fruits at all. Some of these chemicals: benzyl acetate, ethyl acetate and amyl acetate are used as industrial cleaning agents. How do they end up in our “food”? 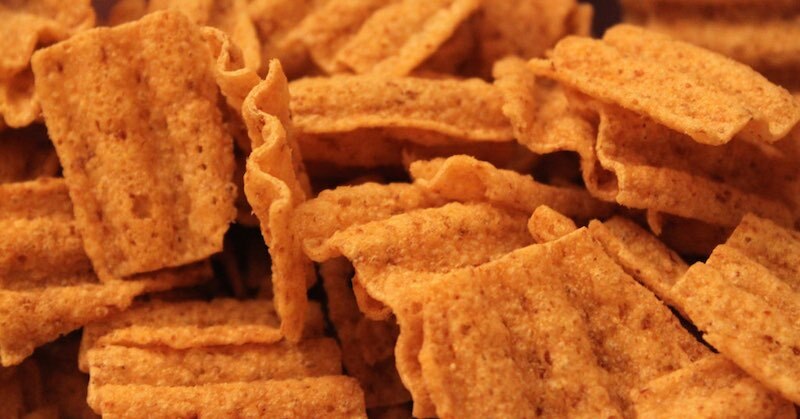 Read: These food additives cause Inflammatory Bowel Disease (IBD). Colors are added to “food” to make them look appealing and attractive, especially to children. They give the illusion of fresh ingredients which are in fact artificial. Colorings are used widely in commercially prepared foods like cereals, canned or packet drinks, biscuits, cakes, ice creams, candies, pasta, desserts, chips, etc. Most of these artificial colorings are coal-tar dye or synthetic dye that are registered as pesticides, or used in the textile industry. Do we really want these in our bodies? These can trigger asthma, cause hyperactivity in children, cause skin rashes, migraine, headaches, blurred vision, reduce digestive enzymes leading to a host of digestive problems, thyroid tumors, mood swings, defects in embryos, reduce white blood cells count, damage kidneys and adrenal glands, damage genes and many many more !! These were initially aimed at reaching the diabetics but are now widely used in a lot of products. They are now sold as “sugar free”, or “zero calories” for the weight conscious. As these artificial sweeteners are sweeter than normal sugar, very little is used thus providing more profit to the food manufacturers. Saccharin is a synthetic coal tar which is 300 times sweeter than sugar but 20 times cheaper. It is used freely in diet soft drinks, chewing gums, sugar-free jams, yogurts, jellies and sweets. Cyclamate is 30 times sweeter than sugar and is often used together with saccharin. Aspartame is 200 times sweeter than sugar and is commonly used in carbonated drinks, sweets, chewing gums, sugar-free jams, cough drops, lozenges, etc. Acesulphame K is 200 times sweeter than sugar and is often used together with aspartame and other sweeteners. Commonly used in diet soft drinks, table-top sweeteners, chewing gum, breath mints, puddings, non-dairy creamers and the like. Artificial sweeteners are deadly and carcinogenic. They can cause damage to eyes, brain, liver and other body organs, birth defects, tumors, leukemia, chronic respiratory diseases, joint pains, vertigo, insomnia, slurred speech, depression, anxiety attacks, fatigue, hyperactivity, stomach disorders, rashes, ringing in the ears, and my goodness … it’s a long list !! Chlorine is used as a bleaching agent in food, much like Chlorox. These agents destroy whatever vitamins that may be left in the food. After which, some coal-tar-derived (carcinogenic—cancer causing) vitamins are added and sold to the unsuspecting public as “enriched”. Commonly found in commercially-prepared flour products like biscuits, bread, cakes, etc. Chlorine, when ingested frequently, can corrode the skin and mucous membranes. It has also been linked to bladder cancer, birth defects and increased risk of cardiovascular diseases. If you have always wondered why your child is hyperactive, and why he always throws a tantrum, check the food he eats. Is he exposed to artificial chemicals in foods? What about when he was in your womb? Were you heavily exposed to these additives? These chemicals upset a child’s biochemistry. He may have difficulty concentrating (ADD), settling down to sleep or may have disruptive behavior. And he doesn’t need more drugs to calm him down! When these artificial foods are removed from his dietary and is given healthy, wholesome food instead, you most likely will see his behavior improve. Even though your child may not suffer from disruptive behavior, keeping him away from these food chemicals will also help him grow healthily. Why Are Chemicals Allowed In Foods? The food industry is big business and helps with the country’s economy. They are cheap to produce and bring in mega profit that goes back into the economy. Like prescription drugs or tobacco—we know that they are outright harmful for our health. Why does the government allow them to be sold? These are big businesses and they contribute hugely to the economy, but at whose expense? Yours and mine! The consumers! So we need to learn to be wise and make the right choices.